Our company and team of professionals understand that vehicle breakdowns can cause a major inconvenience. We offer reliable towing, flatbed services and roadside help. Roadside Assistance – Broken down on the side of the road due to no gas or a mechanical malfunction? Our local towing company will come investigate the problem, decide the best service and get you back on the road. Jump Start Service – Don’t stress, it happens. Good batteries are not immune to failure. Call us and we will offer either a quick jump-start or battery installation from our roadside service assistant. 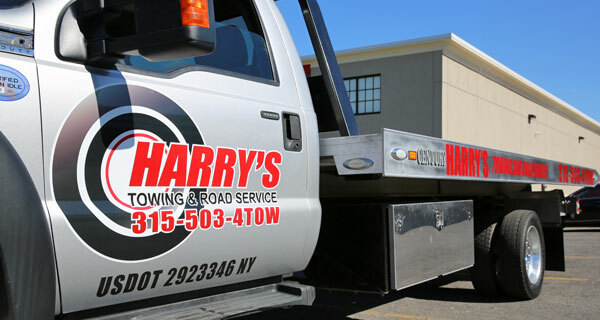 Harry’s Towing & Road Service – You’re not alone. Instead of worrying, call Harry’s Tire & Towing Service. Our friendly customer service is ready to help. Flat Tire Assistance – It’s not planned, but it could happen. Is your vehicle’s spare tire inflated and serviceable? We will install or offer a flat tire change no matter what the weather is. Flatbed Tow Truck Service – Punctual, safe and dependable tow truck, flatbed, auto repair and emergency roadside service and help. 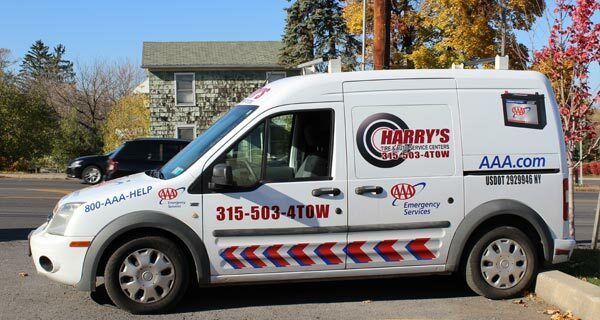 Whether you want us to pick up your car from your home or by the roadside, Harry’s Tire Auto & Towing Services are just a call away.